I have to admit that I was a little apprehensive about how good this book would be. 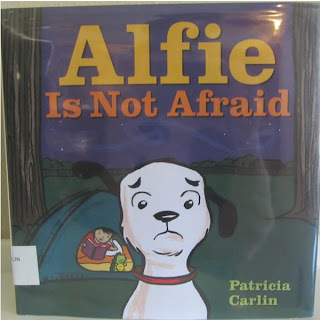 Alfie Is Not Afraid is fantastic, and it speaks to the feelings of children and reminds adults of how we thought we were invincible with our dog by our side. The illustrations are colorful and help tell the story as much as the words. We checked out this book at our local library, but I would be happy to purchase it for the boys. *Build a tent indoors or outside. *Grab some flashlights and go outside at night for a scavenger hunt. *Use the flashlight to tell ghost stories. *Take your dog for a family walk. *Coloring pages for tents and dogs. *S'mores are always a good idea. Reading with the boys is one of my favorite activities, so we are headed to the library for more books.